Hey gang! The time has come for the second installment of a series of posts looking at Matt and Foggy’s many past quibbles, a topic as relevant as it was just over a month ago when the first part of this series was posted. As you might recall, it ended with my mentioning Matt and Foggy’s reunion following the attempt on Foggy’s life. Matt returned from San Francisco to be at Foggy’s side in New York in Daredevil #108 (vol 1). While Natasha would continue to hold a grudge against Foggy for quite some time over his involvement in her being charged for the murder of the Scorpion (see the previous post). Matt and Foggy are quick to resume their friendship, though their professional partnership fails to get back to business as usual. Under pressure from his re-election campaign as District Attorney (to make things worse, this is one of those strange, rigged, only-happens-in-comics kind of campaigns), Foggy asks Matt to come back to working as assistant in Daredevil #126. Matt asks for some time to think about it, but never takes Foggy up on his offer. In Daredevil #129, by Marv Wolfman, Bob Brown and Klaus Janson, something interesting happens. Matt decides to take on a case defending Man-Bull that sees him go up against Foggy in the court room. The case revolves around whether Man-Bull is guilty of the premeditated murder of a man who died while he was breaking into a jewelry story. Matt contends that his client is innocent of the charge against him because the victim died six months after the burglary and only as a result of being badly shocked by Man-Bull’s appearance. Kind of a strange case, if you ask me, but Foggy goes on to win a conviction and Man-Bull goes mental and gets busy smashing up New York. As far as the two partners are concerned, things are pretty tense. Despite the Man-Bull trial, Matt and Foggy are heading toward a legal reunion. In Daredevil #130, Matt decides to go into business for himself by starting the Storefront legal clinic (for the first time), and Foggy happily cheers him on. When Foggy goes on to lose his re-election campaign against Blake Towers (after some villanous meddling) the following issue, he joins Matt at his new practice. Troubles start brewing again almost as soon as the Storefront gets off the ground. The legal clinic is financed by Heather’s father Maxwell Glenn who also is soon found to be involved in more than a few shady deals (As early as Daredevil #131, we learn that he’s apparently a slum lord). Over the span of some twenty issues, this develops into a complex plot that finally reveals that Maxwell Glenn is being manipulated by Purple Man. Meanwhile, Foggy’s girlfriend Debbie Harris is kidnapped, for what might be months, and there seem to be ties to Glenn. With the heartbroken Foggy seeking vengeance on Maxwell Glenn and Matt (as Daredevil) discovering his innocence, it doesn’t take a genius to see a rift opening up. In Daredevil #148, by Jim Shooter and Gil Kane, Matt asks Foggy to defend Maxwell Glenn. 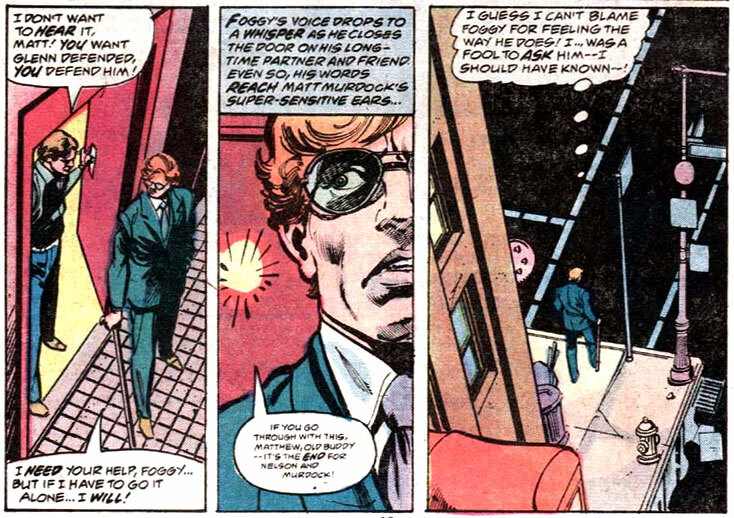 This leads Foggy to kick him out while muttering under his breath that Nelson & Murdock are through if Matt chooses to defend him (see the panel below). The fighting continues over the next two issues, and in Daredvil #150, Foggy calls to yell at Matt for missing a court date. This sequence of events brings up an interesting first in Daredevil. While Matt had certainly been shown to be moody, even a bit melodramatic, earlier in the book’s history, Daredevil #151 sees Matt going through his first bona fide mental breakdown. On top of everything else, Maxwell Glenn has committed suicide and Matt is wracked with guilt. He has trashed his apartment and when Foggy comes over to check on him, his partner’s state has him worried. Finally at the end of Daredevil #152, it is Matt who makes things right by reuniting Foggy with the estranged Debbie Harris, who had been a traumatized recluse since her kidnapping. Next issue, Foggy announces that he’s getting married and asks Matt to be his best man. The Matt and Foggy ride sure is a wild one. For most of the Miller run, there’s little to report in terms of Matt and Foggy’s relationship. In the sense that it’s running pretty smoothly. Foggy is portrayed as a pretty good-natured guy whereas Matt is the moodier of the two, but there isn’t much in terms of diva antics going on. The possible exception might be later in the run when the tables are turned around a bit and Foggy begins to strain under his many perceived burdens and responsibilities. This time, Matt is the one to come to the rescue. The two remain friends into the Denny O’Neil run, until Micah Synn and his gang from the Kingorge tribe show up in Daredevil #202, that is. That odd chapter of Daredevil history has already been touched on in another post, however, so I’m going to refer you to that instead of covering it again here. The short version, though, is that Foggy behaves very, very badly. While Matt and Foggy manage to rebound from Foggy’s betrayal during the Micah Synn storyline, things are heading in the direction of yet another break-up for the two partners. The law firm is not doing well financially and when Matt skips town in Daredevil #221, in the wake of Heather Glenn’s suicide, Foggy is not happy, warning his partner that there might not be a practice to return to when he gets back. In Daredevil #225, the last issue before the Born Again story arc, the practice finally tanks and both Matt and Foggy find themselves out of a job. During Born Again, Matt and Foggy drift apart and lose touch as Matt descends into madness and Foggy gets a new flashy job working for the Kingpin. Foggy pretty much disappears from the scene during the beginning of the Nocenti run, but when Matt takes the case of suing a company named Kelco for dumping the toxic waste which blinded a little boy called Tyrone, he finds himself going up against Foggy in the court room. Matt isn’t actually allowed to practice law after being disbarred so he works with/through another lawyer. In Daredevil #255, by Ann Nocenti and John Romita Jr, we see Foggy dealing with the guilt of representing Kelco. In Daredevil #256, Matt comes to see Foggy, offering him a job at the legal clinic he’s running and berating him for his actions. Glorianna O’Breen, who has been dating Foggy since Born Again, turns Matt’s behavior back on himself and accuses him of being a bully and using his morality like a club. It would take much longer still for the partners to get back together again. In Daredevil #287, we see Foggy busy at work trying to get Matt’s disbarment reversed. At the end of Daredevil #291 (Nocenti’s final issue), Matt and Foggy are finally reunited, and happily so. Nothing tests friendship quite like faking your own death and then showing up again to reveal you’ve secretly been a superhero for years. After a string of issues of business as usual for Matt and Foggy, at the start of Chichester’s run, Matt uses experimental technology and clones (the plot itself is far too complicated to get into) to fake his own death in Daredevil #324. Much later, in Daredevil #347, by J.M. 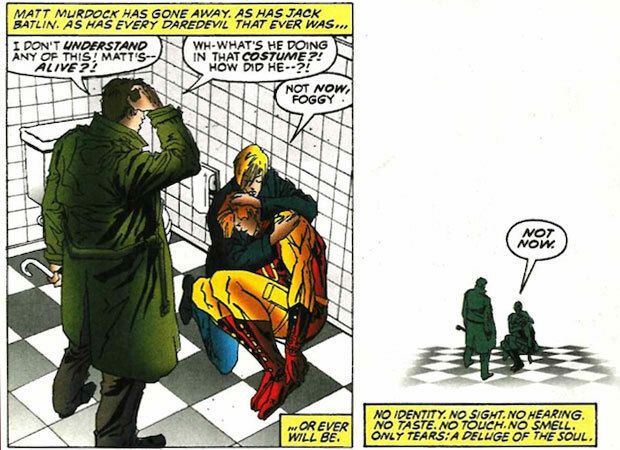 DeMatteis and Ron Wagner, Foggy and Karen find Matt alive and confused, wearing his yellow Daredevil costume. As one might imagine, it takes Foggy quite a while to digest this information, and the two don’t start working together again until Daredevil #353, the first of Karl Kesel’s run, when Matt simply shows up in the court room and follows Foggy back to his office. Despite Foggy’s reservations, this is the beginning of a relatively positive era for Nelson & Murdock and many of the stories told by Kesel, and later Joe Kelly, revolve around the law office and the parterns’ personal lives. For now, we’re leaving Matt and Foggy on a high note, but we’ve got plenty of drama left when the time comes to look at Daredevil, volume 2.